Committee member and Vice President, Charles Zhang and his son Oscar undertook a historical journey in December of 2013, beginning on December 15th. Charles and Oscar followed the route walked by Chinese gold seekers in the years from 1857 to 1863 as they trekked from Robe in South Australia to the goldfields of Ballarat. The journey covered a distance of about 480km and took Charles and Oscar about 16 days to complete. Charles has posted a Thank You letter he has written on behalf of himself and his son Oscar. Feel free to click the link and have a read. See below for a "diary" of their epic trip! SATURDAY, Dec 28th - The day we arrive home!!! We were lead by councillor John Phillips from Arch of Victory to Ballarat City Town Hall. Welcomed by Ballarat Golden Dragon Boat Club members, both my wife & I are the members there. Then we were lead by ex Mayor Neil Steinman to the 1950s Ballarat Chinese icon Billy Butterfly Lane, the old Chinese camp site Llanberris Reserve, then walked up to Tong Way Place, then went down to the last Chinese Joss House site at Main road. After that, we walked past Poverty Point and we finally reached Sovereign Hill. We were specially welcomed by Sovereign Hill Museum president Terry Lloyd & Samantha & Chinese Tour guide team. Sovereign Hill Museum has put in great efforts to save and preserve Chinese history and artifacts in Ballarat, without them we won't be able to see the Joss house and many other items after the demolishing of the last Joss house. We will write our thanks list tomorrow after first sleep in my own bed but it won't be our last journey yet, I will keep writing all the stories we have heard of, many sites we are going to visit soon or later, many leads we need to follow up.... As said from the beginning, this is just a start, there will be lot more to come. Thanks to you all. Supporters at Arch of Victory. Radio interviewing Helen Burzacote the ex president of Ballarat Dragon's Breath Ladies, Michelle Philips the first female non Chinese president of Chinese Australian Cultural Society Ballarat, Bill Moy the fourth generation Chinese in Ballarat and Andy Long the Ballarat University Chinese student. A big surprise to all of us at The Arch of Victory. 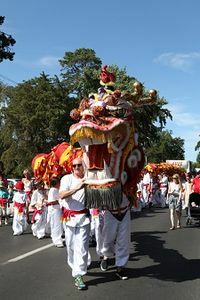 People are from our Chinese Australian Cultural Society Ballarat, from Voiced radio station, from the Chinese descendents, from Golden Dragon Boat Club, from the Dragon's Breath Ladies, from Chinese communities in Melbourne, from basically all parts of Ballarat communities. Desley's very energnic grandson has also joined our walk. We are getting very close now. This is Ballarat newest suburb Lucas. Neil Steinman joined with us walking backward. Rotarian Paul carried a lot of extra weight on his head!!! Arch of Victory. What a achievement Helen, well done. When we were walking from Burrumbeet to Ballarat (along Rememberance Drive), we found this Chinese name showing on a plaque. Oscar met his primary school teacher at the Rotary BBQ party. My Rotary Club (Ballarat South) has held a BBQ at the Desley home near by our camp site so Oscar & I were well fed tonight!!! We are the official public users of the new freeway . Much safer to walk on this road.....no cars. People from Beaufort walkedwith us on the way out as we left for Burrumbeet. Thank you Beaufort. Before we left Beaufort, such a great place & great people, we were told that a local gold prospector has donated some Chinese coins he found in local areas, We feel so happy for Helen Sartan & Beaufort Historic Society and hope that this can be a great start for their Chinese collections. We have learned that there were more than 80 Chinese were buried in Beaufort Cemetery. THURSDAY, Dec 26th - BOXING DAY !! We have visited The Imperial Egg Gallery in Beaufort. Margaret, the owner of this collection, showed us more 600 different egg shells in her collection which is the number 3 or equal second in the world. Margaret also explained the background of tyhe eggs. I did not expect to find that an egg collection can be so huge and of such variety. In a town like Beaufort too!! . All those emu egg collection were done by hand. Artists use knife or other sharp objects scrap away different layer of emu egg shell until it showed the color you wanted or liked. No painting & no artificial colors were allowed to be used. Helen Sartan from the Beaufort Historic Society explains the old news paper and Court House to us and other visitors. Lucy Shen & her family joined us today at Beaufort. Beaufort . Well, well !!! Amazing work done by Helen Sartan from Beaufort Historic Society, she even arranged to have 90 years old Dulcie walk with us, what an amazing walk so far! Beaufort. The mayor of Pyrenees Shire and people of Beaufort walked with us into the town Centre, Beaufort business & historic society representatives welcomed us at the beautiful Band Rotunda.It will be a great day in Beaufort today. Beaufort. Jennifer from Avoca joined & walked with us today. She has done a wonderful community job in Pyrenees ranges. freeway and we faced one of the biggest hills we have walked so far. We are into Pyrenees Shire. Bruce Hammer from Rotary Ballarat South joined us and walk with us. Great, great and great. Buangor to Beaufort. Good morning to all. We are very fortunate to have met Sandy yesterday, she has arranged for us to use Buangor Community Sports Centre last night. We had family and friends Christmas party in there. Thanks Sandy and Buangor Cricket Club. WEDNESDAY, Dec 25th - CHRISTMAS DAY !! Michael & Jian bought us Christmas cake & Chinese green beans soup. Buangor COBB & Co Changing Station beautiful bluestone building. It was built in 1860 as coach & livery stable. The large stable with blue stone slab floor, timber stalls & upper loft, was for many many years a COBB & Co Changing Station. Merry Christmas! Ararat to Buangor. Here we go. We are approaching Buangor. Merry Christmas! Travis and his wife joined us. We just couldn't believe how much support we are getting from Ballarat people. Merry Christmas! Sandy from Santa joined us too. Merry Christmas! Santa is busy today but sent his assistant. So happy to see our Society Cultural school English teacher Donna join us for the walk. Merry Christmas! Brantley joined us. He is the original 2001 walker from Robe to Bendigo and he is also the person who inspired me to get this walk started. Thanks for all your help and support Brantley. Merry Christmas! Andy Long joined us. Merry Christmas! Ararat to Buangor. Merry Christmas to you all. Andy joined walk with us from yesterday. 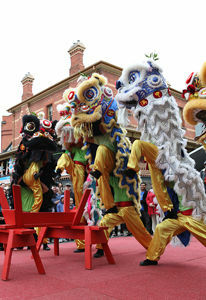 Ararat is the only city in Australia to be founded by Chinese immigrants. This is the Gum San Chinese Heritage Centre. It was built on the site of "Canton Lead". On a Sunday morning in May, 1857, 700 Chinese miners from Southern China, traveling overland from SA Robe to the Clunes, rested at the foothill of the Great Dividing Range replenishing their water supplies at a spring, they discovered the world's richest shallow alluvial Goldfield that stretched 5 km at length. In the first three months of mining, the Canton Lead yielded more then 3 tons of gold. 2km to go. Ararat is in the Pyrenees Ranges near the Hopkins river, it was first settled around 1840, and gold was discovered in 1854. Beautiful gold and red colored of early morning Grampian. 8am we have to be at the Gum San Chinese Museum by 12pm, we will need to push ourselves and maintain a 4km per hour uphill walk. Volunteers in Dunkeld Information Centre. Wonderful people doing wonderful job. Found a private train collection in Willaura. This is the 1870s model guide van. See the raised windows at back. Some of roads, dams, waterways and other structures were built by Chinese in 1850s to 1860s. Believed one reason was to pay off their penalty to carry on their journey to rhe Ballarat goldfields, or they worked in local farms in exchange for food and money. These are fascinating facts which we didn't know much of prior to our trek. Will dig for more details to see what else were built by Chinese at that time and reasons. Mysterious Mt Sturgeon holds many many untold stories. Wendy & Tony Williams took us to this dam near by in the arvo before we went to a volunteer function at Dunkeld information Centre. This dam was built by more than 100 Chinese when they walked passed the area, dam was used for sheep wash. Will be back there for more research. his mates. The army had to force him to do office duty because they said his eyesight was defective but his eyes were perfectly okay. Mr Williams returned home after the war and passed away peacefully many many years later. Our salute to Mr Williams, and their mother Mrs Williams. The plaque for Chinese market gardens. Our thanks to the people of Dunkeld. The old Chinese Market Gardens site, now part of is park and part of is private property. Chinese market gardens were in every places we have walked through. Dunkeld. This was one of the major "stop" points on the Chinese treks. First time we have seen "Ballarat" name appear on a road sign, both of us were feeling pretty special because of it. We are heading home ! Jack Mao joined us for the walk into town. There are so many stories connected with Chinese in this town. After a great dinner with locals in local pub, all we need to do is come back to here as early as possible to get more details. Welcomed by local people and our support team at "The Settlers Cottage". Beautiful town next to the Glenelg river. Ken & Sophie from Coleraine Historic Society holding a mysterious plaque with " C.
LEM" at top and "Chinese Herbalist" at bottom. They would like to know who was this C. LEM ? Photo of Louey Sing in his shop. Photo suplied by the Coleraine historical society. A local lady told me that when her husband was at about 7 or 8 years old, he used a magnifying glass from the outside of shop window aimed at the firecrackers old Louey had in the shop. The boy found old Louey was at the doorway carrying a meat cleaver and chasing after him as the shop had been filling with smoke from exploring firecrackers. Even today, the young boy then and old man now has still a great respect to the old Chinaman Louey Sing. He caught the boy, belted him up but didn't tell boy' parents, it was a man to man gentleman's deal, nothing else. This is the old photo of Louey Sings shop front. Photo supplied by the Coleraine historic society. this urgent feeling just wanted to do it.Late on after meeting with local historic society members I found out this building was right next to a Chinese Fruits shop that used to be run by Louey Sing. The shop building was demolished in 1985. We are heading into Coleraine, our day 6 destination. Day 6 morning at Mountham Hill between Casterton and Coleraine. So nice cool morning after 39 yesterday in Casterton, I had put a jumper on to keep me warm. Busy traffic on this road and so many people waving at us, they must be happy to see us still alive and on the road again. Did a tour by local historic society ladies showing us the dam that was built by Chinese in 1850s and is now shared by 5 properties who use it as a common water resource. Gin Men Kim and many others worked on a boat for their passage and landed in Tasmania in the early 1880s. Fortunately, they were able to secure work in the tin mines.b Most were penniless with neither shelter nor food, but somehow they survived. In 1884, Kim came to Melbourne and it was there he met and married his wife Ethel May. The next move was to Runnymede Station, where other Chinese ran a market garden. One of his sons, Fee Kim at age of 20, opened a green grocer shop in Henry St, Casterton as photo shows. Festival. Warrick Homestead, North of Casterton, is the birthplace of the amazingly intelligent Kellie breed of working Australian cattle and sheep dog. The original "kelpie" was born in 1871; her parents being a pair of black & tan Collies imported from Scotland by Warrock's owner George Robertson. Robertson had a policy of not selling female from stock but had give a pup to his nephew. Jack Gleeson. Jack initially refused to sell but was eventually persuaded to swap the pup for a horse which he fancied. Gleeson named the pup "Kelpie" meaning "...a malignant water sprite haunting the fords and streams in the shape of a horse". Finally we reached the gateway ofthe beautiful city of Casterton. We have been warmly welcomed by Mayor of Glenelg Shire, the birthplace of Victoria, and Casterton historic society members at "Ess Lagoon" a local picnic group and also the water birds home. Today's walk was like you walk in your oven with temperature settled on 38, after 12pm, our shoes start to get gravelly because the tarmac on road was melting. Our shoes were sticking to the tarmac, lucky we had more than 11 litres of water. Due to the heat, we have to change our initial plan, so we only walked 4 hours and we have booked an air conditioned room to cool down. To be honest, I could hear my skin sizzling when I jumped into the shower. This is where we stayed on Wednesday night at a little town called Dergholm. Can anyone tell me how to say it? Haha, it is called "der-gen". As per local historian Alistair Roper: the selectors have been offered 320 acres then plus another 320 acres from Government in 1853. The first town fsurvey was carried out in 1875, so not many people know about Chinese walking past there or near by in 1850s. A lady remembered a Ballarat Chinese named Ron Hon and his cousin used to come to Dergholm playing tennis and always stayed in local Tommy Turner's home about 50 years ago, and Hons were the owners of Red Lion Hotel on Main Road in Ballarat. What an interesting story!!! Will get back to there dig up a bit more information. Sorry to everyone we didn't have much mobile reception last few days. Thanks to those who took deep concerns, Oscar & myself are fine and fit, we do carried more blisters on foot, I had borrowed needle from local pub, only pub in the town, to drain the liquid out all of blisters on his foot and of cause my foot too. Learned this when I was in army, punch two holes on both end of blister, then place a hair, a clean long hair through and leave it there for overnight, pull hair out if no more liquid, your foot will be as good as gold. Old Man is getting better today, but Oscar has 3 blisters in each foot. Tough life. Lesson: "Older is better in long runs"
We are on the way to Dergholm. You can see many old trees has cutting mark which were made by Chinese when they travelled through there in 1850s, marking trees to show their follow countrymen how to avoid walking into swamps. So many trees have marks. We are in Panola now and had a Civic Reception official welcome by councilor Robert Thomas on behalf of the Wattle Range Council at Memorial Park. Oscar and I felt honored and pampered to receive such a great welcome from the people in Panola. We heard some nteresting stories about Chinese cut marks on the trees to tell their fellow Chinese travellers where to go, and we will checking those trees out on the way to Gergholm. Met people from Panola leaded by Councilor Robert Thomas and historian Evelynne Bowden at Chinamans Lane where used to be Chinese Market Gardens that initially supplied vegetables to Chinese walking past there. A local news paper The Border Watch has an article on Sat 8th Aug 1885 of Chinese gardener Tam Wan whose horse ran away with the cart. Closing in on Penola. Well. Well, Well !!! This is what you need if you walk on the road. Oscar is showing how to save 20% of his energy while he is walking. We are near Penola. Santa had crash landing here; Rudolf must have got a flat battery in his GPS system. Kangaroo Inn Ruin. Story about a Chinese man named "Charlie the Chinaman" who was killed in there after arguing with other Chinese in the group. The deer farm. Just see how many deer's antlers in the farm, surly someone in somewhere can find use of them. Chinese use deer antlers for Chinese medicine. Oscar would like to have a set mounted in his bedroom. This site is inside of local deer farm. For generations, local families called it the "Chinaman's Graveyard". And it is on the straight line from Robe to Panola only about 3km from another clay well dug up by Chinese in late 1850s. Now we fully understand why Chinese dig so many wells along the from Robe to Panola, when we run out water yesterday, it was very tough for us to keep going until we were rescued, almost, by water available in Kangaroo Inn school. Underground water table is very high, you could easily find fresh water by digging 3 to 6 feet. Kangaroo Inn Area school kids made a special Chinese memorial corner. Such wonderful school and beautiful kids. Thanks to you all, and I will be back soon. Kangaroo Inn Area School gardens. Thanks Mike for your great work in keeping the school beautiful. Getting hot and more flies welcome us on the way to Panola. Mike dropped us at Geoffrey's place where we did walk to find Chinaman's Graveyard. Had great dinner with Geoffrey and Josie after some maintenance work that we helped with. God knows how many Chinese walked past his property but numbers of Chinese coins found nearby tells big story. We have met this lovely couple Geoffrey & Josie Varcoe from a deer farm very close to Kangaroo Inn this arvo. They have showed us this Chinese Well along the side of Clay Wells road, you can see from the name, there are many wells were dug by Chinese when did they walking past this area. The well is fenced and only about 2 meters deep, bone dry but shows typical way Chinese dig the holes. Geoffrey was the Kangaroo Inn School capital 1964 & 1965, his father was heavily involved with local history and his father told him a story many years ago. He said Chinese used to walked past many different farms or stations work for exchange meat and food, some farmers treated them well and paid Chinese for work they have done, but some of them treated Chinese badly, soon late locals found their front trees has been marked with Chinese characters, the one used treat Chinese would have their job done properly but the one used treat Chinese badly would find their job was done poorly or badly. Beautiful morning after first night. 3 blisters plus 2 unhappy hips, one sore wrists by sharking hand with flies. We soldier on. Here we go at the section of 18 ks mark. Lucky day first day! Met Larraine Falkner, the owner of Karatta Winery, she knows lots histories about Chinese walk past properties nearby in 1850s. She even knows of a well dug by Chinese to drink fresh water when they stopped there. Check on their website and go there ask her more stories. Read back label about Chinese walk. Only wine label in Australian mentioned about Chinese walk. Yes Oscar, you can go in there but drinking water only. Oscar cleans up his socks. No flies zone. Ha ha !! Oscar & I got there late arvo, checked in motel then we walked along the Guichrn Bay. The weather is just perfect, almost, as motel lady said it is windy and sometimes the wind would blow your head off....you kidding me ! Windy ? it is like one of best day in Ballarat ! Local people have been spoiling us. Shirley Snook, local historian said she had a very busy book launch day today, so she nicely refused my warmest invitation for having dinner together. Because she is going to be very special tomorrow morning for our launch of Walk With Us at Chinese Memorial with some very special guests at 8am local time. Remember it will be SA time 8am which is half hour behind us, Victoria time 7.30am. We had a unplanned lunch stop at Cavendish Bunyip Hotel, we were trying to catch up with friend Alan but he was too busy, so we met his daughter Jenny and a local historian Joyce Gordon. Bad luck Alan you didn't turn up so we had a great time. Buy me coffee next time.